Jaguar Land Rover has seen a "great turnaround." Jaguar Land Rover no longer plans to close one of its three auto plants in England after reaching an agreement with trade unions. JLR, which Ford Motor Co. sold to India's Tata Motors in 2008, said it would be significantly increasing the number of models in its range and creating thousands of jobs over the next decade. Last year, Tata said it would merge two JLR plants in England as part of a business plan to tackle the impact of the economic downturn on demand for vehicles, which had seen its manufacturing running at less than 60 percent of capacity. Jaguar Land Rover CEO Ralf Speth said on Friday the company is now seeing a "great turnaround" in its business. The carmaker will keep a Jaguar plant at Castle Bromwich and a Land Rover factory in nearby Solihull, both in central England, as well as its Halewood facility near Liverpool in northwest England. Speth said the company had already begun hiring 1,500 new employees at its Halewood factory to help with production of the Range Rover Evoque, a new small SUV that launches next summer. Production at Jaguar Land Rover plants has rebounded after slumping during the global recession. Tata said Friday that JLR sales rose by 16 percent in September to 19,528 vehicles and have increased by 40 percent to 112,287 since the start of its fiscal year in April. Tata will invest 5 billion pounds ($8 billion) in the JLR factories over the next 10 years. More than 14,000 workers are employed at JLR's five British sites, which include three manufacturing plants. 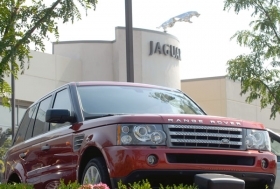 Tata bought Jaguar Land Rover from Ford in June 2008 for about $2.3 billion. Francisco Camilher-Carvalho, analyst at IHS Global Insight, said that with new, diversified products in the pipeline and Tata's established network in India, JLR was well placed to gain market share. "The major driver we've had in luxury cars recently was the emerging markets and as Tata now owns Jaguar and Land Rover ... it gives them a little head-start in relation to other premium manufacturers," he said. "They will have the contact base in India and know how to adapt to the market."